The Ho Chi Minh City Department of Agriculture and Rural Development met May 4 to discuss helping salt makers in Can Gio District who have been hard by cheap imports. At the meeting, Phan Thanh Thuoc, chairman of Tien Thanh salt cooperative in Can Gio District, said that the cooperative had a bumper crop this year thanks to a new production method in which workers produce salt on nylon canvas instead of directly on the ground. The new production method has doubled salt output over last year to reach 120 tons per hectare. And the salt grains are much purer, salt farmers said. However, a kilogram of salt now sells for just around VND700, compared to VND1,700 last year, thanks to a wave of salt imports, many from India. Though the cooperative had been able to sell its salt – because of it’s higher quality – only 50 hectares in Can Gio are using the nylon canvas method, meaning that 1,500 hectares in the district were employing other farming practices. Most farmers outside the cooperative still produce salt with traditional methods, which yield lower outputs and fetch lower prices. They can’t compete with cheaper imports. Mr. Thuoc said that the cooperative had already bought all salt made by its members and a small portion produced outside the group. But it does not have enough money to buy and process more for sale. According to Government regulations, the cooperative is only allowed to borrow an amount that does not exceed the capital contributed by its members, about VND3 billion (US$158,000). Although the cooperative is able to consume more salt and its loan projects have been deemed very feasible by the Bank of Agriculture and Rural Development, the cooperative has not been able to take more loans. Mr. Thuoc said the cooperative built a salt processing plant in 2009 and several food processing companies have bought salt made by the cooperative instead of importing from Thailand, India, and China. The cooperative’s four warehouses now can accommodate an extra of 4,000 tons of salt but they are empty. Tran Quang Phung, chairman and general director of Southern Salt Group, who is also chairman of southern salt association, said Korean companies loved to make kimchi with Can Gio salt. He said it was because the taste of Can Gio salt was not as sharp as salt from Central Vietnam. The group exports about 60,000 tons of Can Gio salt to Korea annually, however in recent years, the group could not find enough high quality salt to process this year. Mr.Phung said that several farmers outside the collective focused only on quantity not quality. As a result, the salt grains are mixed with soil and are slightly yellow in color. He also said that even though the local supply of salt was short, prices were falling due to import policies that let too much foreign salt into Vietnam. 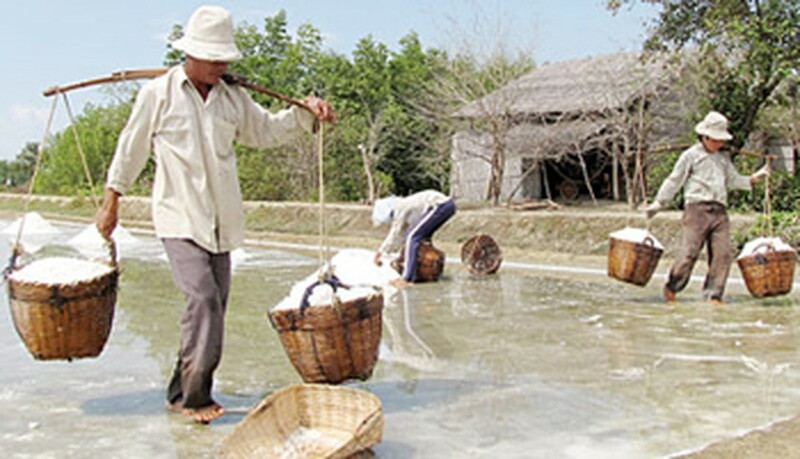 To help salt makers, Nguyen Trong Liem, official from the Agriculture and Rural Development, said that his department would coordinate with the city’s Agricultural Consultation and Assistance Center to organize a conference of salt processing businesses to discuss buying salt from farmers through preferential-interest loans. Mr. Liem also said that his sub-department would also assist the Tien Thanh salt cooperative to sell its salt products to supermarkets in the city and other provinces. The sub-department will also petition the Government to limit salt imports, Liem said. The southern salt association has said that the Government should discharge quotas granted to businesses and has proposed the common taxes of 50 percent to help domestic salt production.